THE SOLITUDE AND LONELINESS OF THE MOMENT WHEN THEY COME TO TAKE THEM AWAY, THIS LAST VOYAGE, WHERE ARE YOU AT THIS VERY MOMENT, PARTISAN OF HUMAN RIGHTS ? WHY HAS THE WORLD SUDDENLY BECOME A VAST DESERT WHERE THERE EXISTS ONLY THE VICTIM AND HIS EXECUTIONERS? HOW MUCH LONGER CAN YOU STAY SILENT ? HOW MUCH LONGER CAN YOU STAY SILENT? neighbor are killed and one policeman is seriously injured. 2. In July 1980, Ali Tabatabai is killed in Washington D.C., United States. 3. In 1981, Shahriar Shafigh is killed in Paris, France. 4. In January 1982, Shahrokh Missaghi is killed in Manila, Philippines. Germany, by the pro-Iranian Hezbollah. 6. In June 1982, Shahram Mirani is fatally wounded in India. 7. In August 1982, Ahmad Zol-Anvar is fatally wounded in Karachi, Pakistan. 8. 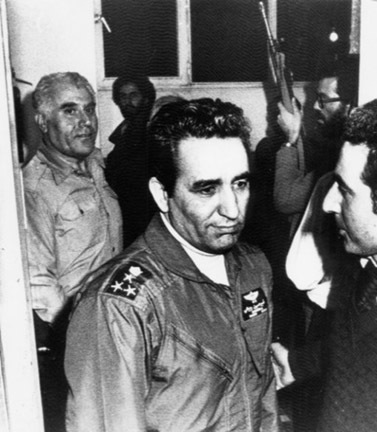 In September 1982, Abdolamir Rahdar is killed in India. 9. 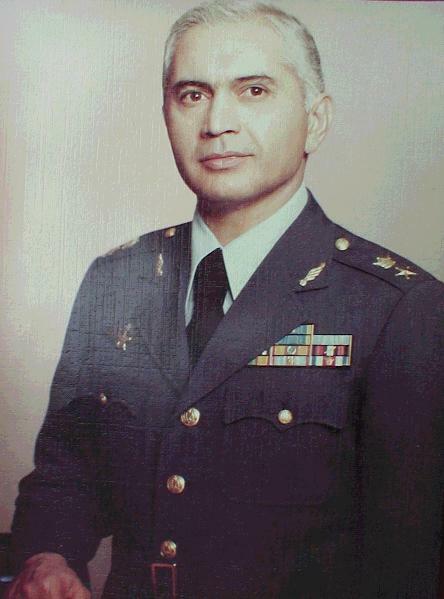 In 1982, Colonel Ahmad Hamed is killed in Istanbul, Turkey. 10. In February 1983, Esfandiar Rahimi is killed in Manila, Philippines. 11. In February 1984, Gholam-Ali Oveissi and his brother, Gholam-Hossein, are killed in Paris, France. 12. In August 1985, Behrouz Shahverdilou is killed in Istanbul, Turkey. 13. In December 1985, Hadi Aziz-Moradi is killed in Istanbul, Turkey. 14. In August 1986, Bijan Fazeli is killed in London, Great Britain. 15. In December 1986, Vali Mohammad Van is killed in Pakistan. 16. In January 1987, Ali-Akbar Mohammadi is killed in Hamburg, Germany. 17. In May 1987, Hamid Reza Chitgar disappears in Vienna, Austria and is found assassinated in July. are wounded in residences of Iranian refugees Karachi and Quetta, Pakistan. 20. In July 1987, Mohammad-Hassan Mansouri is shot dead in his house Istanbul, Turkey. 21. In August 1987, Ahmad Moradi-Talebi is killed in Geneva, Switzerland. 23. In October 1987, Abol-Hassan Modjtahed-Zadeh is kidnapped in Istanbul, Turkey. Commissioner for Refugees in Karachi, Pakistan. 25. In June 1989, Ataollah Bay Ahmadi is killed in the Emirate of Dubai. 26. In July 1989, Abdol-Rahman Ghassemlou and Abdollah Ghaderi and Fazel Rassoul are killed in Vienna, Austria. 27. In August 1989, Gholam Keshavarz is killed in Cyprus. 28. In September 1989, Sadigh Kamangar is assassinated in the north of Iraq. 29. In September 1989, Hossein Keshavarz, victim of a terrorist attempt, is paralyzed for life. 30. In February 1990, Hadj Baloutch-Khan is killed by a terrorist commando in Pakistan. 31. In Mars 1990, Hossein Mir-Abedini is wounded by an armed commando in the airport of Istanbul, Turkey. 32. In April 1990, Kazem Radjavi is killed in Coppet, Switzerland. 33. 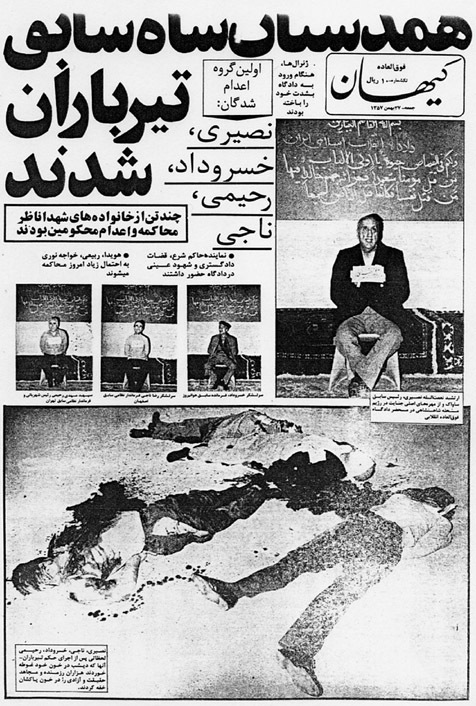 In July 1990, Ali Kashefpour is kidnapped and killed in Turkey. 34. In September 1990, Efat Ghazi is killed in Sweden by a bomb intended for her husband. 35. In October 1990, Cyrus Elahi is killed in Paris, France. 36. In April 1991, Abdol-Rahman Boroumand is killed in Paris, France. 37. In July 1991, Alberto Capriolo is wounded in Milan, Italy. 38. In July 1991, Hitoshi Igarashi is killed in Tokyo, Japan. 39. In July 1991, Ahad Agha is killed in Suleimanya, iraq. 40. In August 1991, Shapour Bakhtiar and Soroush Katibeh are killed in Suresnes, France. 41. In September 1991, Sa�d Yazdan-Panah is fatally wounded in iraq. 42. In December 1991, Massoud Rajavi escapes a terrorist attempt in Baghdad, iraq. 44. In May 1992, Shapour Firouzi is killed in Iraq. 45. In July 1992, Kamran Mansour-Moghadam is killed in Suleymania, Iraq. 46. In August 1992, Fereydoun Farokhzad is killed in Bonn, Germany. 48. In January 1993, Ugur Mumcu is killed in Ankara, Turkey. who had disappeared in June 1992 in Turkey. 50. In March 1993, Mohammad-Hossein Naghdi is killed in Rome, Italy. 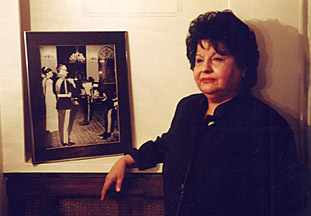 who was kidnapped in Istanbul, Turkey in December 1992. 53. In November 1993, William Nygaard is wounded in Oslo, Norway. 54. In January, 1994, Taha Kermanj is killed in Corum, Turkey. 55. In August 1994, Ghafour Hamzei'i is killed in Baghdad, iraq. 56. 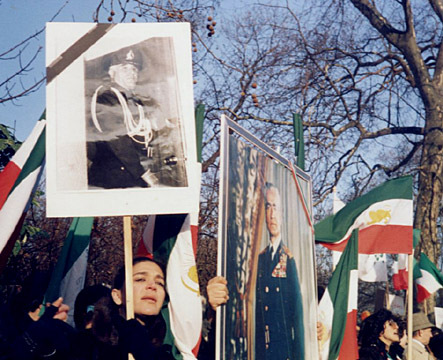 In February 1996, Zahra Rajabi and Ali Moradi were killed in Istanbul, Turkey. 57. In March 1996, Ali Mollazadeh was killed in Karachi, Pakistan. 58. In May 1996, Reza Mazlouman ( Kourosh Aryamanesh) was killed in Paris, France. inalienable right to a referendum for determining our future. as a responsible, free and prosperous nation..."
In the corner of a busy cafe in London, a fifty-nine year old woman sits quietly contemplating the photo on the table. There is a hard look in her dark eyes disguising the inner pain she must be feeling. The picture clearly shows a heavy-featured man with silver hair and sharp, intelligent eyes. He appears calm and defiant. He is dressed in a bush shirt and trousers and has a cut on his right cheek. He bears his sudden change of fortune with remarkable composure; having accepted that he would soon be a dead man, he has clearly decided not to dishonour himself in his own eyes. Dressed in complete black, the general's widow has been in mourning ever since that terrible night when her husband was shot. The circumstances of his death have been known for many years. He was among the first batch of pro-Shah officers to be tried and executed by a revolutionary firing squad shortly before midnight on February 15th, 1979. Twenty-two years after the event, the gruesome details surrounding his final moments still exerts a powerful fascination. "Everyone knows his name," she says proudly, wiping a tear. "Nobody will forget him. He was an exceptional officer. He died for what he believed in. He no longer belongs to me but to history and the Iranian people." General Mehdi Rahimi may belong to history, but a day still does not go by when she doesn't think of him, and like most faithful widows clinging to the memories of a life spent together, her husband's love will live in her heart until there is no longer a breath in her body. Every year, on the anniversary of the revolution which ended centuries of monarchy in Iran, Manijeh Rahimi finds herself bordering on madness. "I want to explode," she says. "I feel sad and angry. How can I ever forgive what happened to our country and my husband?" Behind the image of a dignified widow hides a lioness. Her character was forged by the role thrust upon her by the tragic events and a desire to respect Rahimi's memory. She has an energetic look about her. She belongs to a breed of Iranian women who have gone out of style. Her wealth consists in a disarming simplicity. Even if one is not at all in agreement with her politics, her pro-Shah ideology, and strong opinions, one cannot help but respect her. When I first met her last spring in the same cafe, the general's widow seemed concerned only to make me feel at ease. Her voice was warm and vibrant, her expression smiling and jovial. It was a Wednesday afternoon and she was in a hurry to see her physiotherapist. "Everything you want to know is in there," she said handing me a tape of an interview she had made to an Iranian radio station in Los Angeles. We had talked for an interesting hour over a cup of coffee, often avoiding distressing questions. Instead I had asked exclusively about herself: about her childhood, her family, her trials as a wife, mother and a military widow. She had charmed me at once, without effort. Leaving the cafe she insisted on doing a bit of shopping. Before saying good-bye, she handed me a few blackberries. "You must come to my house for dinner next time," she said, pulling down the window of her taxi. "I'll show you some pictures that may interest you." Over the next few weeks I thought about her continuously. Even though there were many differences between us, we both had a similar sensibility, the same love for our country, the same sense of humour, the same way of seeing the past. We had instinctively been drawn together by the tragedy of Rahimi's heroic end. We must all die one day but it is the manner of death that will echo through eternity. For some people Rahimi had become a myth. He was something lofty, noble and brave. I still remember how during the revolution we had huddled in front of our television set to watch the captured generals being "interviewed." It had been obvious to us that some of them had been tortured. Nassiri, the former secret police chief, could barely speak. In a parody of justice they were forced to recant their loyalty to the Shah. Rahimi, the former Military Governor of Tehran, had refused. Not once did he flinch or show that he was afraid. I was told by his widow that he found his courage by holding between his fingers, a piece of cloth from Karbala, kept in his side trouser pocket. We were looking at a man who faced certain execution, perhaps within hours. He smiled at his interrogators. He spoke of the orders he had given during the previous few days in his quiet Farsi which was translated by Ibrahim Yazdi, a member of Khomeini's Revolutionary Council. "There was disorder and it was necessary to send in forces to restore order," Rahimi had said. "Even now, my men know what to do." There was no question about his loyalty either. He was an imperial officer who had sworn on the Koran to defend the Shah and the constitution. At one point, Yazdi had asked him, "Whom do you recognise as your overall commander now?" His response had been firm and in a way summarised everything that Rahimi had stood for in his life. "My Commander-in-Chief is His Imperial Majesty, the Shah." I was sixteen when the first executions were announced. Horrified and worried by the impact of such news on an impressionable teenager, my father had tried to hide the newspapers from me. But I had already seen the big headlines and the grisly photos of Rahimi, Nassiri, Khosrodad and Naji lying in a pool of blood. Not a single word critical of the summary trial, or of the verdict, had found its way into the many pages devoted to the killings. From that day on, I was haunted by the death of Rahimi. I wondered about his final moments. But what about Rahimi's widow? She was a living person. I tried to picture myself in her situation. Or at least to imagine it. I was besieged with questions. What had she been through? What did she feel now? The more I thought about her, the more driven I became by a single desire, a mixture of journalistic curiosity, the excitement of the writer in search of meaning and pure human interest in this woman's extraordinary destiny. I wanted Manijeh to tell me her story, and I wanted to write it quickly. I admit it became an obsession. It was a cool summer's evening when I arrived at her apartment. Most of the guests were elderly ladies and their husbands. The general's widow was a perfect hostess filling our glasses with drinks and handing out pistachio nuts in a silver bowl. For a while, like most exiles, we allowed ourselves to forget that there had ever been a revolution in our lives. We traded the latest jokes and listened to some heavy classical Persian music. We feasted on delicious saffron rice, eggplant stew, yoghurt, kababs, flat bread and mixed salad. After dinner, while everyone sipped tea, I allowed my eyes to wander round the living room for any clues that would reveal something about the man. Everything in her apartment reminded me of the general. It was a shrine to a loyal soldier who had paid the ultimate price for God, Shah, and country. The most striking icon hanging prominently in the living room was a large photograph of General Rahimi at a ceremony at Niavaran Palace. Resplendent in his blue and gold uniform with medals hanging down from his broad chest, the general could be seen bending halfway, his lips kissing the monarch's extended hand with traditional reverence. There were other photos on the tables. Mrs. Rahimi held out a silver frame. "This was taken at the wedding of General Amini Afshar's daughter," she said nostalgically. "That's my husband in the white suit and the woman next to her is my sister, Parivash Fatemi." I looked at it carefully. Rahimi looked particularly handsome in his summer suit, his face tan and relaxed. In another corner of the room was a rare picture of him as a young school boy with a bow-tie. "And this one over here was taken at our house a month before he was killed," she said, pointing her finger to another frame resting on the mantlepiece. There was a certain sadness in Manijeh's voice and her eyes brimmed with tears. The last picture, as she called it, showed him standing by the door, wearing his military cap and shiny uniform. One could almost read the tension in his drawn face. It was a portrait of a doomed officer. That evening I watched her. The general's widow behaved like someone used to socializing, but her eyes revealed a barely disguised grief. Her solitude in the midst of all those people having fun, or pretending to, was touching. True, sometimes she would join in the frivolity, make fun of herself, but then everything would go quiet. I was perturbed by this woman. At the same time, she intimidated me. I didn't know what to say to her. Just the mentioning of her husband's name was enough to evoke injustice, horror, disgust, the unutterable. Questioning her now, I thought, would be intrusive. And yet, I was burning to know everything. "Tell me about your late husband," I pressed. "How did you meet? What sort of man was he? Did you love him a lot? Was he good to you?" Each time I questioned her about her late husband she stared at me in a melancholic sort of way. She squeezed my hands and smiled. "My Rahimi was something fantastic," she replied. Her eyes dropped to her lap as if my questions had somehow brought back memories she wished to forget. "I have nothing but happy memories of him," she said, pouring more tea. "We would have never met had I not smashed my car into a fruit stall that day." A smile appeared as she explained how in 1968 she had sat in her open top Fiat covered in huge watermelons and surrounded by a crowd of curious onlookers. "It was like an Italian movie. There was Rahimi, the chief of police, standing over me in his bright uniform and baton. Despite my protestations he had taken the side of the merchants and confiscated my driver's licence." The following day, Manijeh, herself the daughter of a military general, had humbly reported to police headquarters. "Rahimi was seated behind his desk," she recalled. "He looked magnificent and very handsome in his uniform. He had a chest made for medals. He greeted me with a charming smile and ordered tea. When I described my accident to him he burst out laughing. Behind him was a large eagle and I asked him if he was an eagle. He seemed to like my forward nature and a few days later he paid me a visit with a friend." They had dinner and for the next three months Rahimi sent her flowers and letters. Although flattered by his attentions, Manijeh was not interested in getting married again. "I was too busy working as a public relations officer," she said. "Besides I was taking evening courses at Tehran University and at twenty-seven I had just divorced my first husband and was living with my parents with my baby daughter, Shireen." At forty-seven, Rahimi was considered one of the Shah's top officers. After divorcing his French wife, he went over to Manijeh and asked for her hand. She accepted but agreed to wait until Rahimi had received permission from his superiors. 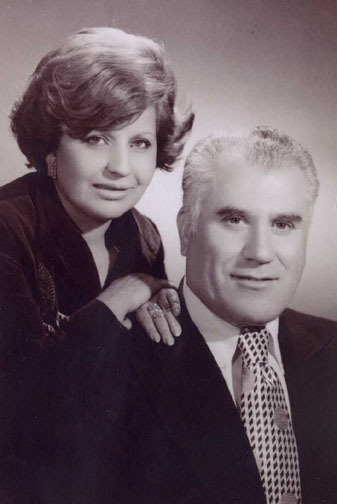 "My sister, Parivash, had been married to Hossein Fatemi," she said. A staunch opponent of the Shah, Fatemi had served as Prime Minister Mohammad Mossadeq's foreign minister and executed by royalist forces in the aftermath of the 1953 counter-coup that had restored the Shah to his throne. "This posed a security issue," she continued. "General Berenjian, the chief of counter-intelligence, discussed the matter with the Shah at his Caspian villa in Nowshahr. His Majesty, who had always respected and provided for Fatemi's widow, accepted. We had a small wedding, with the late Ayatollah Behbahani performing the ceremony." "We were married for eleven years," she sighed. "From a personal point of view I was the happiest wife in the world. We lived in a house on the grounds of the Saadabad Palace where the royal family spent their summers. In addition to his police duties, Rahimi was also the deputy-commander of the Imperial Guard, and president of the wrestling federation. Every morning, I would get up with him at 5am when he did his daily exercises to stay trim. When he would leave the house I used to thank God for giving me such a good man. We never had a bad moment together. He worked very hard, spending twelve hours in the office, coming home late at night. He gave me anything I wanted. My life revolved around him. His life was my life." Gradually, as our conversation lengthened, another portrait of the general emerged. He was, according to his widow, a man who tired easily from the court parties and was more at home in downtown Tehran, mingling with the common people. "Rahimi was a man of simple tastes," Manijeh told me. "There was something of a Sufi dervish in his character. We used to go out to the 'Golden Horizon', his favourite hangout. People of all walks of life would come up to him. He was always joking with them and patting their shoulders. His staff adored him and his office was always full of beautiful women desperate to meet him. I used to get very jealous but never showed it. He never cheated on me and I called him three or four times a day to ask him if he loved me. He would always laugh and say 'No' which was his way of telling me his feelings." As she spoke, someone put on a Delkash cassette. "Rahimi loved Persian music," she said her eyes lightening up. "He enjoyed Iranian films but had little time to read. He was a very honest man with a good sense of humour, a friendly nature and a good voice too. Despite his heavy workload he always made time for Shireen. He spoiled her on every occasion. She used to call him Baba Timsar and put on his military cap for laughs. On the weekends we used to escape Tehran and climb the hills where Rahimi would sing to me." For the next seven months the general's widow and I maintained our contact on a sporadic basis mostly by telephone. Her memory of the revolution was hazy. She was, however, remarkably lucid when describing the wedding of General Amini Afshar's daughter in the summer of 1978, six months after the first demonstrations in Qom. "It was a real lavish affair held at Hotel Darband, a favourite of Tehran's high society," she said. "Ladies arrived in their evening gowns anchored to their important husbands in smart suits. Liquor and wine as well as soft drinks and fruit juices were served in the marble reception hall under the gazing portraits of the royal family. In the sweet-smelling garden a magnificent buffet had been laid out with a variety of foods and a wedding cake. Under a bright silver moon Fereydoun Farrokhzad sang sweet melodies for the pretty bride, lovely in her silk wedding dress, as she danced with her proud father." On that same night, as people danced, somewhere down in the glittering city, policemen were running street battles with demonstrators calling for the overthrow of the Shah and the return of Ayatollah Khomeini from exile. "I remember my husband telling me that there was some trouble in town and that General Badrei had been unable to make it to the reception," she recalled. "None of us could have forseen that in a space of months, my husband, Amini Afshar, Neshat and almost every other officer who had attended the wedding, except for Gharabaghi, would be arrested, tried and placed against a wall and executed." The Shah and most of the political elite seemed almost oblivious to the simmering volcano beneath them until Iran exploded. In September 1978, after several days of demonstrations during which scores were killed, the monarch acceded to pressure from his generals and declared martial law in Tehran and eleven major cities. Suddenly the streets of Tehran, always bustling with cars, were replaced with tanks, weapons and soldiers. On November 5th, the capital suffered its worst case of rioting in fifteen years. Hundreds of buildings went up in flames. The Shah appointed a military government under General Azhari and went on television promising to hold free elections once order was restored. The armed forces remained broadly loyal to the commander-in-chief to the bitter end, but they were helpless to combat nationwide civil disobedience. "As each day passed," the general's widow recounted, "I grew more and more fearful of the future. Everywhere I went people were clustered around the radios in shops, in cafes, or at home, waiting for the latest news on the BBC. People spent hours talking to one another on the telephone, trying to find out the latest rumors. As a broken Shah withdrew from the public eye oil workers went on strike and the country became paralysed. We began to receive threats by anonymous people. They threatened to pour acid on my daughter and kill my husband. Each time Rahimi left the house I grew more and more afraid that I would never see my husband again. I was convinced that someone would shoot down his helicopter or kidnap him. But even during the revolution I did not show him my true feelings. My fears were my burden and mine alone." On January 16th, 1979, the Shah flew into exile, leaving behind him a regency council and a new government headed by Shapour Bakhtiar, a respected opposition leader. "The day His Majesty left Iran I rushed to see my husband," Manijeh remembered. "Rahimi looked terrible, his eyes swollen from sleepless nights. He was sitting in his chair, his collar opened and he was smoking a cigarette while his doctor checked his blood pressure. He forbade me to utter a word about my feelings on the matter. He buried his head in his hands and wept. He loved the Shah, maybe too much. He told me that with him gone, Iran was lost." Khomeini's triumphant return to Iran on February 1st completed the demoralisation of the imperial armed forces. Prime Minister Bakhtiar displayed enormous courage and resolve to prevent Iran from falling into the abyss. With the Shah gone many of the military leaders began their secret negotiations with Khomeini's revolutionary camp. A few of the generals were rumoured to be plotting a coup but it was all talk. "I remember a heated discussion at our house," Manijeh told me. "Badrei, the commander of the ground forces, Neshat, the head of the Imperial Guard, and Rahimi were very worried. My husband kept shouting that Gharabaghi, Moghaddam and Fardoust were committing treason. I had never seen them so upset. Badrei kept repeating that if the mollas seized power the mob would kill them all and parade their heads in the town square. Looking back they all seemed like passengers on a burning plane about to crash into the desert." But the worst was to come. Late in the evening on Friday, February 9th, 1979, all hell started breaking loose among the military when fighting broke out between units of the Imperial Guards and pro-Khomeini airmen. For the next two days Tehran was in the grip of revolutionary insurrection. Fearing that the rebellion would spread, Bakhtiar telephoned General Rahimi and ordered him to establish new curfew hours for the capital from 4.30pm to 5am. But Khomeini supporters ignored the curfew and fighting continued all around the city. In the prevailing pandemonium, Manijeh who had already sent her daughter away to safety in London, found herself stranded alone at her house in Saadabad Palace. "These were scary times," she recalled during our third meeting at her favourite cafe. "During the last days, my husband had been spending the nights at his headquarters. I used to visit him twice a week. We were constantly in touch by phone. I was very anxious. On that Saturday most of the police stations and army installations had come under attack. When I rang him, Rahimi warned me not to come to see him. I ignored him and went to Lavizan where I met General Badrei. I started to cry and Rahimi came out of the conference room. He was very upset at me and said that if I wanted to see him again I should go and stay with Amini Afshar's wife. It was the last time I saw him." To this day Manijeh blames General Abbas Gharabaghi, who passed away last year in Paris, for the death of many officers including her husband. On Sunday, February 11th, 1979, the Shah's last chief of staff, persuaded twenty-two generals to issue a statement declaring that the armed forces would remain "neutral" in the crisis. The fate of the Bakhtiar government was sealed. Except for General Gharabaghi, all the military leaders were immediately taken into custody. General Rahimi was picked up in the streets by armed youths and taken to the Alavi School, where he was exhibited with his colleagues on national television. "When I saw him on television I became ill and fainted," Manijeh recalled. "I never expected anything like this. Overnight our lives had turned upside down. From that night when they captured Rahimi until the next morning I was on the phone to Badrei. I wept but Badrei kept reassuring me that Rahimi was in safer hands than he was. I hardly slept. On Monday morning I heard that Niavaran Palace had been captured. Air Force General Rabii and several senior officers declared their solidarity with the revolution and the Imperial Guard surrendered. General Badrei was assassinated. When I phoned his office at noon someone told me that Badrei had been killed by armed gangs." The execution of her husband remains one of the most painful episodes of her tragic story. "Even thinking about it now tears my heart," she says. "I was still in hiding when my friends broke the news to me. They had heard it on the morning news and from their whispers I gradually learned the horrible truth. I became hysterical." After that she became a different person. "I refused to comb my hair for months," she recalled. "I went to pieces, mentally and physically. I had to be sedated. The next four months were very difficult. I was in a terrible mess and had to change houses as the revolutionaries were after me. There was a rumour that I was part of a revenge committee and that I went around in a red car killing revolutionary guards. They even published a fake photo of me with a machine-gun. Our house in Saadabad was looted and all traces of my past was erased for good." The general's widow never saw her husband's body. Finding a burial place proved difficult. Rahimi and other former officials of the fallen regime were considered traitors and not deserving a final resting place among good Muslims. He was finally buried after five days -- under an assumed name so that fanatics wouldn't dig him out. "Life can be strange sometimes," Manijeh told me. "Two months before escaping Iran a blind old man sought me out through a friend. He said that over the years my husband had visited him at the Shah Abdol-Azim Mosque where he worked as a guardian and given him money. Because of that he had become a rich man and when he had learned of the general's death he had decided to give part of his wealth to his widow." In exile, Manijeh spent the first few years grieving her loss. Then gradually she found herself getting stronger. "It was because of Rahimi's strength and confidence in me, that I was able to go on," she confesses. She has neither asked for nor received any favours. She is making her way alone and with dignity. We met for the last time, five days before St. Valentine's Day. Sitting in at the French cafe in north London, she spoke fondly of Rahimi as her husband, patriot and martyr. Throughout she gave me the feeling of a woman who had lost the man of her life. "I loved him," she said with tears escaping from her eyes. Despite her grief she tried to make us happy, finding pleasure in treating us nicely. Before taking her home she surprised my fiancee with a large, heart-shaped chocolate box. Behind her stoic suffering I had discovered a kind and generous soul. When we left her at the foot of her apartment she had a big smile on her face. Although it was pouring with rain, her smile was pushing away the clouds, gently filling the sky with warmth, laughter and with the promise of sunshine. While waving us good-bye she blew us a kiss and we felt that her eyes were full of hope as if she was greeting her lost Valentine and embracing him all over again. I Am Seeking My Destiny Today. I Have A Rendezvous With My Beloved. Makes my blood boil when I see so many extraordinary top ranking military officers killed just so the two madmen saddam & khomeini could enter a war, buy weapons, and give away the Oil! So Germany could sell it's Chemical weapons! France could test fighter jets on Persians! and they haven't found cheeper lives anywhere else I guess! Since they all agreed and planned the Coup against the Shah of Iran, and killed our bravest generals, and massacred out youth, and knew very well Iran is left volnerable and defendless. Where the hell are you now freaky Jimmy? your nobel prize up yours, for worrying so much over our "Human Rights" situation during the Shah!!! Either you applogize for the 79 Coup to both Nations, for being an indirect cause of 9/11 in NYC and Crimes in Iran! or we will make sure that peace prize goes with you to the coffin, up your dirty A$$...topped with some crude oil for your mummification! We WILL hold US responsible for this mess... if 9/7 this year is just another SCAM to get our brave young men killed again! I mean whatever's left of them after the 100,000 massacred in 2 yrs, millions dead in war, about 1/3 addicted & God knows how many with Aid, etc. WHAT DO WE HAVE TO LOOSE NOW? MAY AS WELL GO SIGN THE 'ESTESHHADI' PAPERS AND SHOW THEM WHAT GOES AROUND COMES AROUND! Tof be rikhte har ki tooye federasion boodeh: yek mosht Vatan Foroosh e Moft khore Ajnabi paraste kale pook. be naame daneshjoo va roshan fekr! tof be rikhte tak takeshoon ke hanooz daran dore donya migardan Arrrrrr o Arrrrr mizanan. When 18th of Tir comes along, we remember 18th of the month of Tir of the year 1980, when the daggers of the summer sun accompanied the brave-hearted Iranians who wanted Iran and Iranian people to be proud. We remember that clouds of malevolence brought about thunderstorm of death and those brave-hearted ones remained only on the page of the history of love for homeland. When 18th of Tir arrives, we also remember the year 1999 and another generation of passionate women and men of this land, this time students and youngsters and how did each one of them only borrow golden daggers from the sun of the summer sky as symbols of pureness and freedom so they could wipe out darkness and filthiness. And we saw how the dark minded rulers dropped into fear that they reacted with destroying, burning, killing, as if they could imprison the light. We did see the passionate flames that kindled from that day and remained and spread out all over homeland Iran. Now the youngsters of Iran, here and there throughout our homeland only shout for freedom. No doubt that on this imminent 18th of Tir, the world shall hear the outcries of all libertarians. The National Leadership Assembly for Opposition to IRI is among (in the midst) of all you people. Wherever there is outcry for freedom it is on your sides. The repressive forces of the regime must know that supporting a dishonest, charlatan, and murderous regime, is only feeding on blood stained bread. Patrolling the night will not stop the dawning of daylight. We say to all human right organizations that the sickle of death has come close to the throat of many of our dissident prisoners. We say to Reporters without Borders� that your comrades, writers and journalists protesting the Islamic regime with their endless hunger strike are walking on the border of death. Hear them and reflect their outcry muffled in their throat throughout the world. At the threshold of the 18th of Tir, to the political prisoners� families, we say that you are not alone; we shall convey your voices all throughout the world with whatever means we can access. 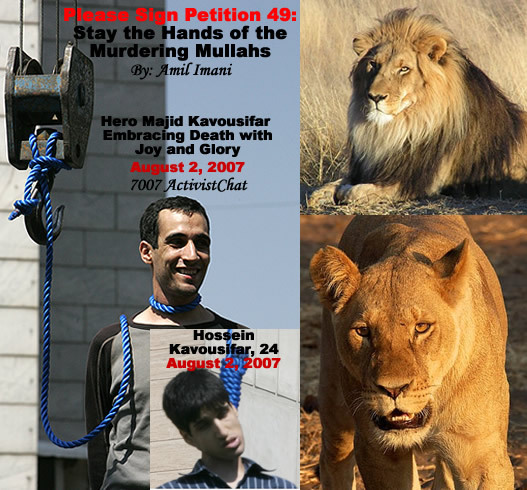 To the dark minded rulers of the Islamic Republic, We say that you can not shoot love, you can not chain truth. Freedom will arrive and in its saddlebag will bring gifts of dignity, welfare, and security to all of us Iranians. In USA Ms. Homa Ehsan and Dr. Iman Foroutan are available on behalf of "The National Leadership Assembly for Opposition to IRI" for Interviews with Media, to schedule appointment for lecture, interview or attend the public session of "The National Leadership Assembly for Opposition to IRI" please call. What Iranian, what human being, could read the above story of General Rahimi and his widow without crying? What a man, what a hero, what dignity, what charisma! He is the absolute image of a perfect Iranian, patriot, and soldier. He will go into history as one of Iran's bravest and most loyal sons. We need to pay homage to him and all others like him, who stayed loyal until their end. You don't need to see a fancy Hollywood movie like Braveheart to experience the wide range of emotions of loss, sorrow, anger, betrayal, and pride. You only need to hear these real life stories of our countrymen. General Rahimi is our William Wallace. The evil acts of the wicked ultimately serve to show the goodness of the righteous. My father is enlisted above .. Thank you cyrus for bringing this into light! because of people like my father and many many others, WE WILL NOT GIVE UP THE FIGHT! We will be back in a FREE Iran and bring justice back and convict those VICIOUS mullahs baijs and spies who killed our fathers, our brothers, mothers, sisters and cousins! This Islamic SHITpublic of Iran will pay and I will personally make sure of that! As the younger generation, we should unite and fight against them, despite of our ideological differences! We must repair where our parents have failed. 18 Tir (Iranian date corresponding to 8/9 July) marked the important inflection point of the separation of the movement of freedom-loving Iranian people (Iranian Air Force, Army 1980 Uprising and Students Uprising 1998) from the Islamist Invaders and Occupiers of Our Motherland Iran. On February 1st, after refusing to see Bakhtiar in Paris, Ayatollah Khomeini flew to Tehran amidst great popular acclaim. "Until the last minute the government was torn between diverting his plane to Kish Island in the Persian Gulf or letting him land,"
Former Prime Minister Amouzegar revealed. 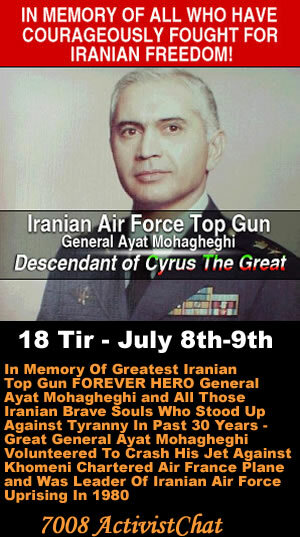 "A few Air Force officers like General Ayat Mohagheghi volunteered to crash their jets against the chartered Air France plane. At the end permission was granted and Khomeini landed safely with his entourage. During the coverage of his arrival a few loyalists interrupted the TV programme with a portrait of the Shah and the imperial anthem."